There was something missing, in Mass Effect 3. The game was filled with a hundred tiny details that paid homage to all the choices and deliberations I'd made in two previous games, and yet one thing sat unfinished. Aria T'Loak sat on the Citadel for all of Shepard's last crusade, riding out the end of all things in a cushy balcony in a bar that wasn't hers. And everything about that felt wrong. Aria is an intergalactic badass, a blue crime-lord whose iron fist rules the most notorious hive of scum and villainy that Mass Effect's universe has to offer. Would she, honestly, sit around and let Cerberus just keep her station? Well no, of course not. It's just that her campaign to retake Omega—one that sweeps up Commander Shepard, who Aria might grudgingly concede is the galaxy's second biggest badass—got saved for DLC. Ever since her introduction in Mass Effect 2, this asari is clearly a person NOT to be trifled with. She has an agenda. She has goals. And she'll use any tool that comes to hand—including one on-again, off-again human Spectre—to make them happen. As these things nearly always do, the campaign to retake Omega begins with a message at the Commander's private terminal. It's time, Aria says, and she leaves instructions for you to go to specific coordinates on the Citadel. From there, you're off. Shepard does have to go without her companions, which is uncharacteristic. Aria justifies it as not liking the company you keep. Of course, the good Commander is not alone: Aria herself becomes a fierce, extraordinarily powerful ally, as does a turian called Nyreen. Aria and Nyreen are both biotics and, for once, it's a mission that seems almost tailor-made for my Shepard of choice, an Infiltrator. WHY: It's an excellent addition to the game, one that gives the player a new take on a fan-favorite character and place. Type of game: Expansion content to Mass Effect 3, complete with moral decisions, interesting discussions, aliens, and shooting. Lots and lots of third-person shooting. What I played: The whole DLC arc. Skipped most of the optional side-quests in the interest of time; start to finish, about 2.5 - 3 hours on Normal. Aria T'Loak. Getting more than a few words with her in a dark bar—the extent of her presence in ME2 and ME3 prior to Omega—is just wonderful. Omega (the place). Exploring more of a gigantic station that we only saw a tiny fraction of in ME2 is satisfying. Glitches. Nothing game-breaking but some weird character motions and occasional peeks through geometry that were disorienting and broke the tension at all the wrong moments. Elevators. What is this, Mass Effect 1? Speaking of Nyreen, I would be remiss if I didn't take a moment to discuss her, the much-vaunted first female turian to appear in the series. For all that the Mass Effect franchise has done remarkably well with its human gender depictions over the years, its representations of other species have been somewhat lacking. Despite Codex entries and in-game conversations that speak of complex and more-or-less egalitarian societies, it took until Mass Effect 3 for the krogans and the salarians to get on-screen female representation (and all of them go veiled or hooded), and until Omega for us to meet Nyreen. Happily, she's a great character. She and Aria play beautifully off each other. If Aria is the quintessential renegade on Shepard's shoulder, then Nyreen is the constant paragon. They have opposing goals and philosophies and yet orbit each other, each being drawn into the other's perspective. Each makes an entertaining foil for the other, and brings balance to the overall narrative. Aria's personality is enormous and could easily overshadow everything, and Nyreen's could easily be overbearing and sanctimonious. Together, they achieve an excellent equilibrium. And blow things up. Boy, do they ever blow things up. Two powerful biotics, together with Shepard's sniper rifle, made short work of most enemies. Such short work, in fact, that at first I thought I must have set the difficulty to casual or narrative. While combat does get more challenging as the DLC progresses, I felt that there were two major simplifying factors. The first is that I have played a significant number of multiplayer matches. As the single-player content for ME3 evolves, it takes more and more cues from its online multiplayer sibling. I recognized the wave types I was playing, particularly the two that were "kill [X] high value target" and "disable 4 [Y]," and approached them accordingly. (The latter is where being an Infiltrator comes in particularly handy.) Multiplayer ME3 also gave me a set of reflexes and tactics that influenced the way I handle the single-player game, making me more mobile and focusing my energy on flanking maneuvers. All of those are smart tactics in Omega. The second is a lingering suspicion that my Shepard, who started the mission at level 59 and primed for an end-game that, thanks to the awkward placement of single-player DLC, she'll never reach, is simply overpowered. Omega is a story that feels as if it would fit best as a parallel tale to a major event that's already inside Mass Effect 3, [SPOILER] the ousting of Cerberus from the Citadel between plot acts [END SPOILER]. Aria may essentially be the mafia don of Omega, but wandering through her bunker isn't that different, materially, from wandering through the Citadel. There are very few humans here, but the batarians, turians, asari, and salarians are working together — with the same hushed and worried conversations, the same fragmentary losses, the same concern and grief that's displayed in the ice-blue halls of the galaxy's government. Here, in its seedy red underbelly, is the flip side to the utopically crisp base of operations we are used to. 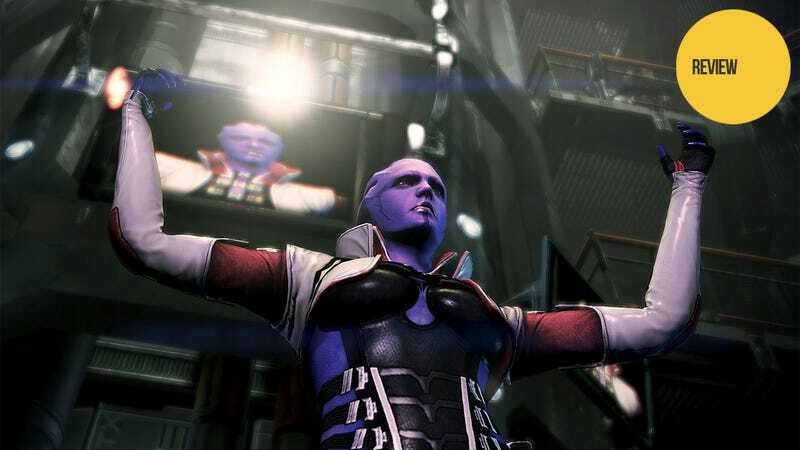 For all that Omega brings some new things to Mass Effect 3, in a bigger sense it's all about revisiting the old. The new enemy type, the adjutant, is fearsome, though not quite as bad as a banshee. Introducing them through use of suspense, silence, and a darkened, difficult-to-navigate map ramps up their menace, of course. Still, survival horror isn't ME's strong point. Decision-making is. Near the climax, I had to make a decision that I, as the player, wasn't really comfortable making. I wished, in that moment, for Shepard's constant companions to be with her. I would have welcomed Garrus's dry observations on the cold calculus of war or Liara's compassionate understanding. Instead, Shepard stood alone. I find myself wondering, after the fact, if there was really a true decision to make at all or, if like the Mass Effect 2 DLC Arrival, the game would in the end have undermined my ability to make Shepard's choice. Someday I may play through again and find out. For now, what I know is that it tempted me three times with an alternative I didn't want to take, and on the third, I caved in and made the call. Of course, standing alone lets Shepard cut loose a little, too. It's hard not to revel in the chance to capture some well-earned renegade points throughout the mission to retake Omega. My Shepard may have a do-gooder streak as wide as the Citadel, but she's not stupid. There's a time and a place for everything, and standing next to a heavily armed, thoroughly pissed off Aria T'Loak is not the time to try gently persuading anyone of anything. In the end, then, Omega is a worthwhile romp, entertaining in its own right and valuable for how it expands the world of the game it's attached to, as well as the world before it. It does connect back out to the larger story of Mass Effect 3, even while remaining concerned entirely with itself. (A lot like Aria.) Afterlife always had its motif of flames by its entrance, a futuristic LED display mockingly leading its visitors to hell. When the actual station is on fire, and the galaxy around it burning too, its gaudiness feels eerily prophetic, a little too on-the-nose. Shepard, too, sees the pattern of all things. When Aria mutters, "We can't field an army large enough," Shepard retorts, "Then we need to find allies. Hmph — story of my life." The quest for allies is, indeed, the story of Shepard's life. Aria, and the underclass of Omega, are as unlikely an ally as ever the space marine had. And yet, in two games, she makes good. Omega is Aria's home and Aria's story. We, and the good Commander, just get brought along for the ride.